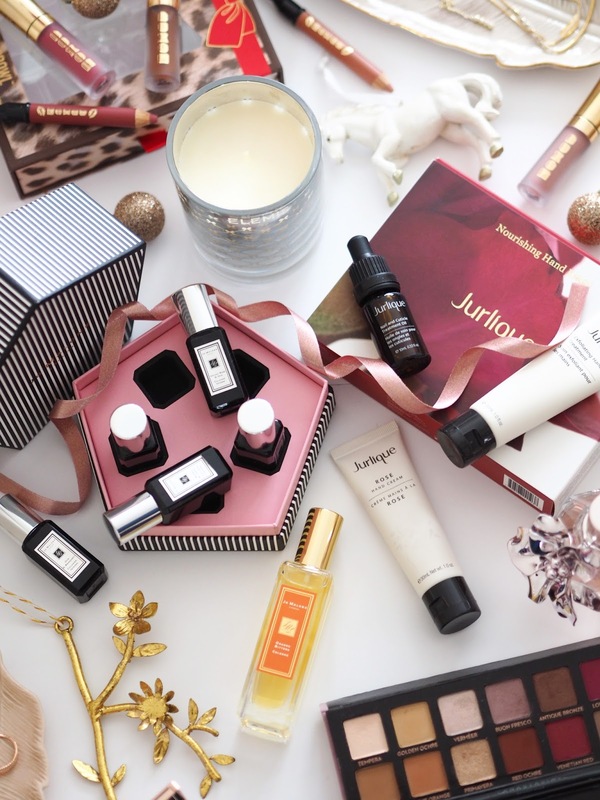 Today I am kicking off my week of Christmas Gift Guides with my Luxury Edition! I'm talking 'main presents' for the most special women in your life such as Mums, Sisters, Daughters & Wives/Girlfriends. I've compiled a list of pieces from some of my favourite luxury brands that I think your loved ones would be over the moon to receive this Christmas! Most pieces are over £25 but I have also included some little luxuries that are slightly more affordable but still from high end brands. Check out my previous Gift Guides here Ultimate Pink Gift Guide, Scented Gift Guide & Stocking Filler Gift Guide. Nothing says Luxury quite like Jo Malone! It's definitely an aspiration brand and I feel super excited whenever I can add a new product to my collection - usually at Birthday's and Christmas. Orange Bitters is a fragrance exclusive for the festive season and back by popular demand from last year! Described as "A warm winter cocktail. Take two dashes of bright citrus, add sweet orange and a burst of ripe mandarin. Finish with a splash of bitter orange to reveal rich prune and a base of sensual sandalwood and amber." You can get it in the 100ml bottle for £94 or an exclusive online size of 30ml for £47 which is what I have here! 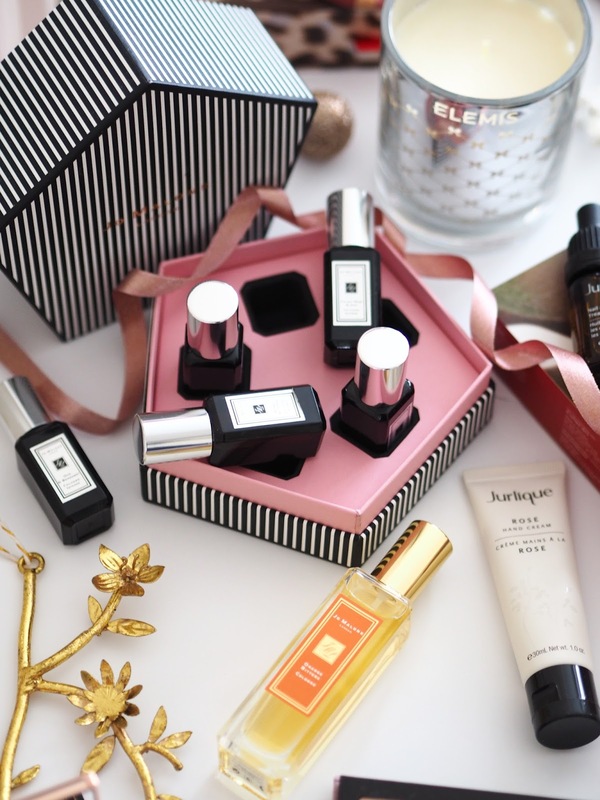 The Cologne Intense Collection is packaged beautifully in a black & white striped hexagonal box with pink interior. It consists of 5 mini 9ml perfumes including: Tuberose Angelica, Velvet Rose & Oud, Dark Amber & Ginger Lily, Myrrh & Tonka and Oud & Bergamot. The Cologne intense range is always that bit more expensive that the regular range so it's amazing to be able to try them out before buying a large size I think. I can say from experience that the 9ml bottles last a long while too! This set is limited edition for Christmas so make sure you don't miss out. This Buxom Lipstick Set from Debenhams is the perfect gift for any girl like me who loves their make up! With a trio of Full-On Lip Creams and 3 matching liners you'll have their lip wardrobe sorted. Charlotte Tilbury is without a doubt my absolute favourite luxury make up brand! 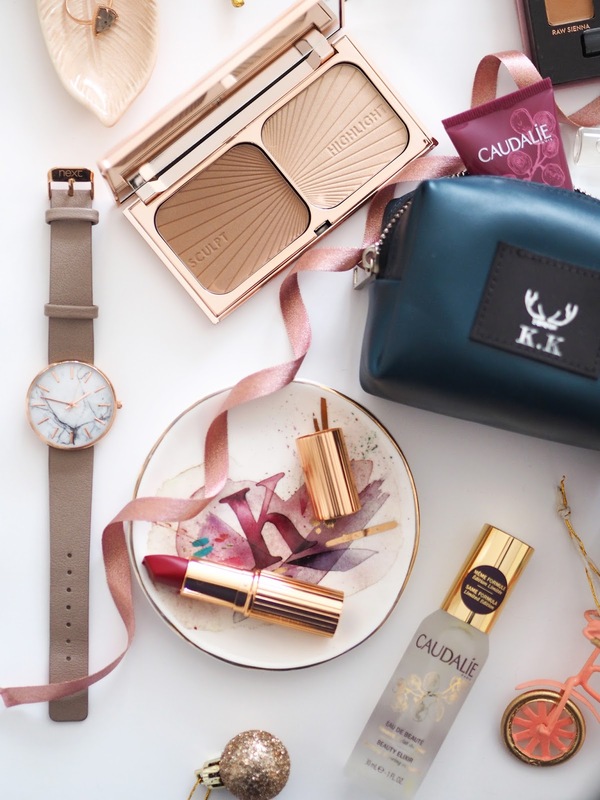 The rose gold packaging, the exceptional quality and variety of products what girl wouldn't swoon?! My top picks for gifting this season would be the Red Carpet Red Lipstick which is that perfect festive red shade but really classic too, it's in her Matte Revolution formula which is my favourite. The second is the Bronze & Glow Highlight & Contour Palette which is I think is definitely one of her most coveted products. Those two products together would make a dream present! This Mink Marble Next Watch looks super Luxe and is only £28! Marble is so on trend right now and teamed with the mink strap I think makes it a timeless piece. The Modern Renascence Palette by Anastasia Beverly Hills has to be one of the most coveted and instagramed palette of the year! 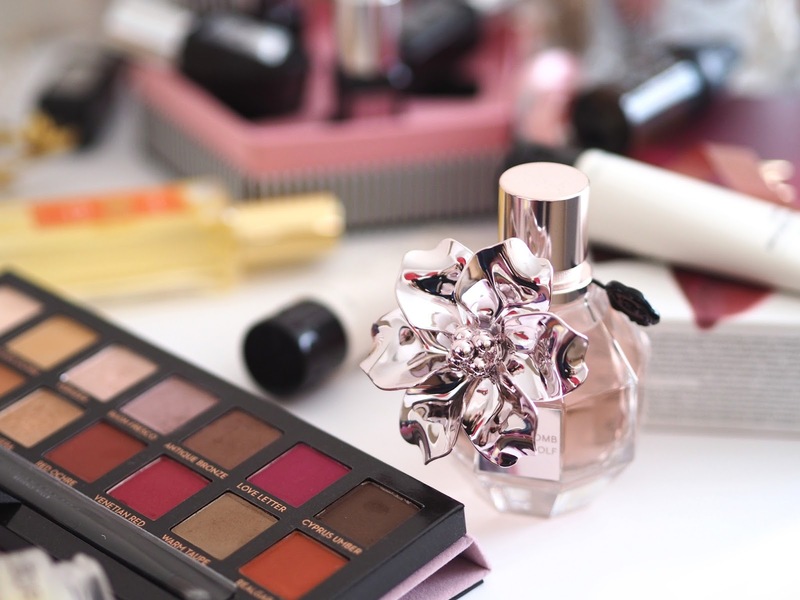 With the most beautiful shades and dreamy formula any girl would be happy to open this on Christmas morning. The Decleor Aromessence Neroli Night Balm is such a luxurious product, packing with natural ingredients and is an absolute dream to add to any skincare routine! Go Personalised | One of the most special gifts you can give to someone you love this Christmas is something handmade & personalised! This Monogramed Make Up Pouch from DS London is perfect for those everyday essentials that always end up getting lost at the bottom of you handbag. Not only is it handmade but it both looks & feels super luxurious plus it can be personalised with your initials. You are also helping to support a small business, something which I am particularly passionate about! ~ Use my code: KK10 at the check out for 10% off your purchases from DS London, but be sure to get your orders in before Dec 15th for Christmas delivery! ~ If you're feeling generous I thinking adding a Charlotte Tilbury Lipstick inside would make a nice touch. Another beautiful Personalised find is this Initial Trinket Dish from Anthropologie which is so pretty to add to the dressing table. I have always dreamed of owning the Viktor & Rolf Flower Bomb perfume so when I spied this stunning Limited Edition that's exclusive to Debenhams this year I just couldn't resist any longer! The classic perfume bottle has been embellished with a gorgeous pink metallic rose. The scent is described as "an explosion of the most luxurious flowers, leaving a trail of allure wherever you go!" The perfect gift to spoil your sister or daughter with. You may know Elemis better as a Skincare brand but did you know they also make candles? This Soothing Glow Candle looks really high end sitting on your dressing table and has the most beautiful fragrance that matches their Pro Collagen Cleansing Balm, including lavender, eucalyptus and geranium. 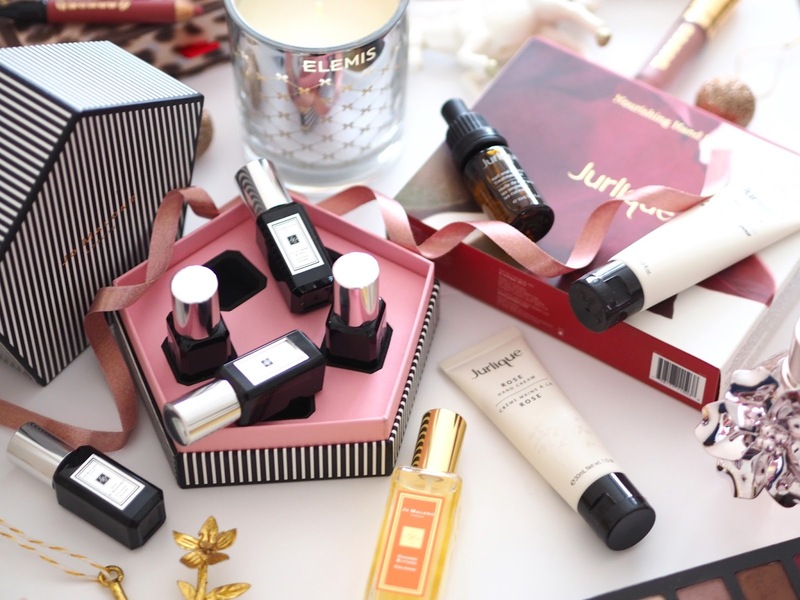 Jurlique is a brand that I adore and this Nourishing Hand Ritual Gift Set contains such a perfect combination of products! It includes their Rose Hand Cream, Exfoliating Hand Treatment and Nail & Cuticle Treatment Oil. Considering it's valued at £31.50 it's a fantastic price at only £25 plus the packaging is beautiful! The Z by Accessorize Jewellery Collection looks so luxe but doesn't break the bank! Their pieces are so finely made mostly in gold of rose gold and often set with previous gem stones. Feather dishes are from Next. Little Luxuries | Tree Ornaments I think are such a lovely gift to get for someone. Not only are they a keepsake that can be brought out year after year but you can really tailor them to the recipients personality! I've chosen a few from Anthropologie and they are of such good quality with exquisite detail that they're far from the kind you could just pick up in a supermarket. I picked up a little Pink Bike Carrying a Christmas Tree and a Gold Monogram Ornament with my initial K - FYI: I have already given my family one each of these with their initial on as an early Christmas gift! Anthropologie currently have up to 30% off their Tree Ornaments right now too! The cute little Unicorn one came from Debenhams. 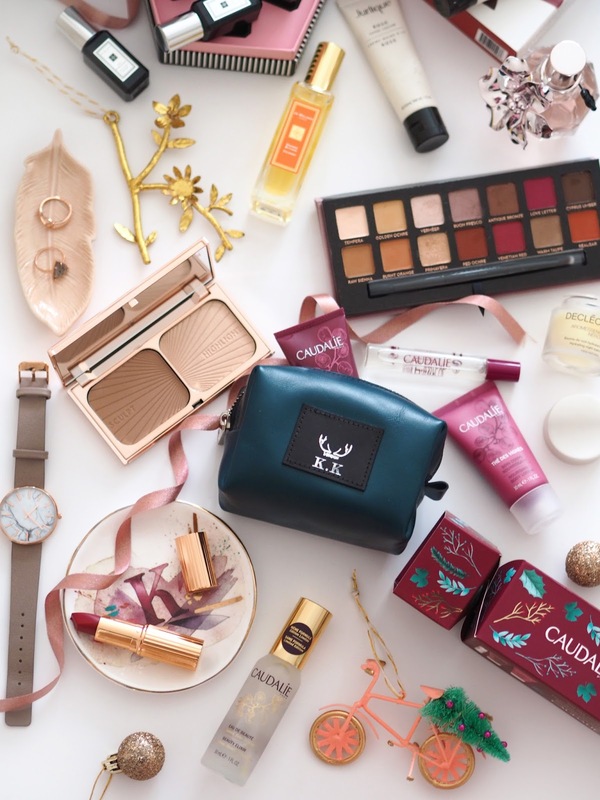 Caudalie are a fabulous skincare brand and have released some great gift sets for the Christmas season! My favourites include this Des Vignes Cracker Set containing a trio of products: 10ml Fragrance, Shower Gel & Nourishing Body Lotion. All products scented with a dreamy combo of white musk, neroli flower, jasmine & ginger. I think would make a wonderful luxury stocking filler or table decoration for your female guests on Christmas Day! 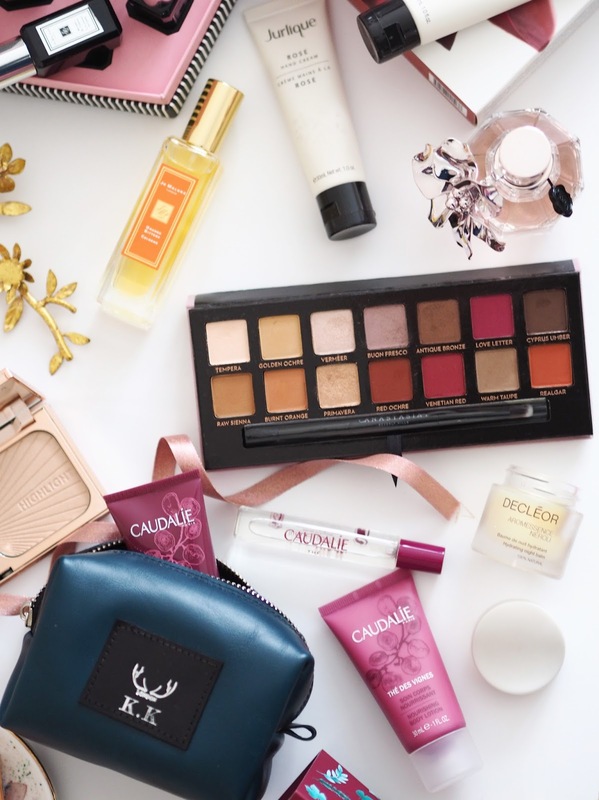 My other pick has to be the Beauty Elixir Bauble because it contains Caudalies most iconic product that is loved by every blogger! The Beauty Elixir is a facial mist provides an instant boost of radiance, tightens pores and smoothes fine lines. You can use this product in so many ways from setting your make up, a spritz of hydration mid day or as a toner after cleansing - definitely one to add to your list! Be sure to get your orders in before the 15th for Christmas delivery. 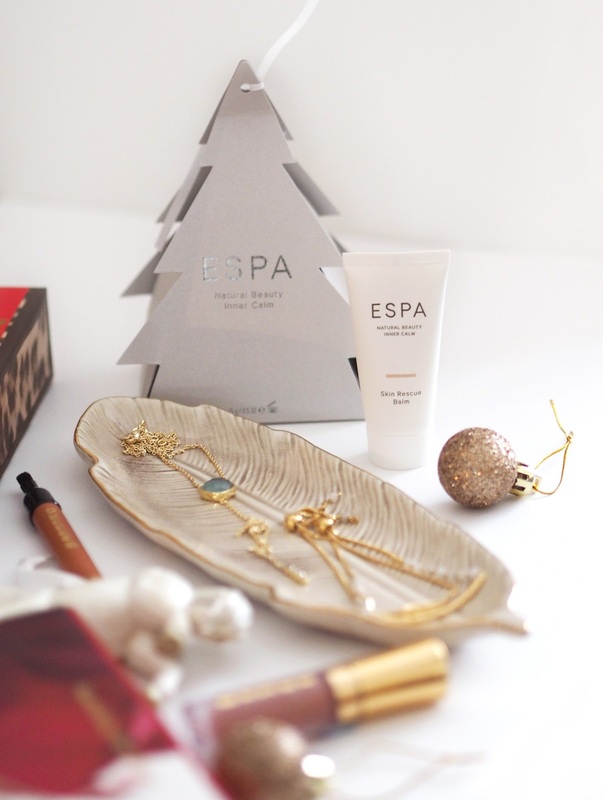 Espa's Tree of Wonder is such a cute little gift, it has a ribbon so you can hang it on your tree and inside is their multi purpose skin rescue balm. Which is a beautiful product that can be used on everything from lips to dry skin and cuticles! Those will make sure great gifts!